Explanation: Magnificent island universe NGC 2403 stands within the boundaries of the long-necked constellation Camelopardalis. Some 10 million light-years distant and about 50,000 light-years across, the spiral galaxy also seems to have more than its fair share of giant star forming HII regions, marked by the telltale reddish glow of atomic hydrogen gas. The giant HII regions are energized by clusters of hot, massive stars that explode as bright supernovae at the end of their short and furious lives. 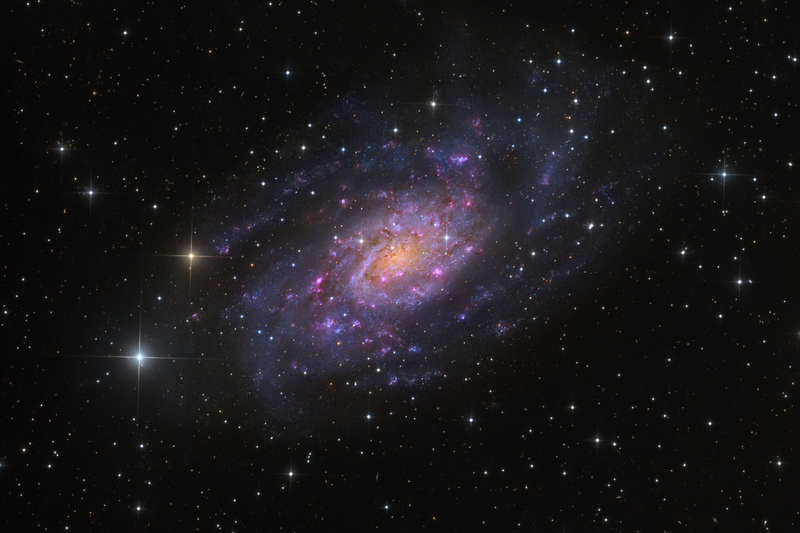 A member of the M81 group of galaxies, NGC 2403 closely resembles another galaxy with an abundance of star forming regions that lies within our own local galaxy group, M33 the Triangulum Galaxy. Spiky in appearance, bright stars in this colourful galaxy portrait of NGC 2403 lie in the foreground, within our own Milky Way.